Seabirds are probably at greater risk of suffering the negative impact of oil spills than most other marine wildlife because they spend much of their lives in contact with the sea surface and because coastlines, where seabirds congregate to breed, may receive a build-up of oil via wave and current action. 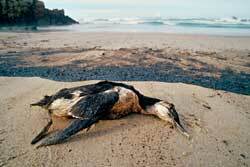 Indeed, large oil spills killed a dramatic numbers of seabirds. Hence, direct bird mortality immediately following an oil spill typically attracts the greatest public and scientific concern. Nevertheless, delayed (long-term) effects are especially expected in seabirds because they are long-lived animals and upper trophic level consumers. Thus, seabird exposure to oil through contaminated sediments or prey items could potentially elicit adverse physiological responses and birds may be affected indirectly via habitat change and reduced food availability, which, in turn, have long-term population consequences. 3) indirect effects mediated through a reduction on the availability of fish preys.